Forget-me-not. The name itself is as charming as the tiny, sky-blue flower. 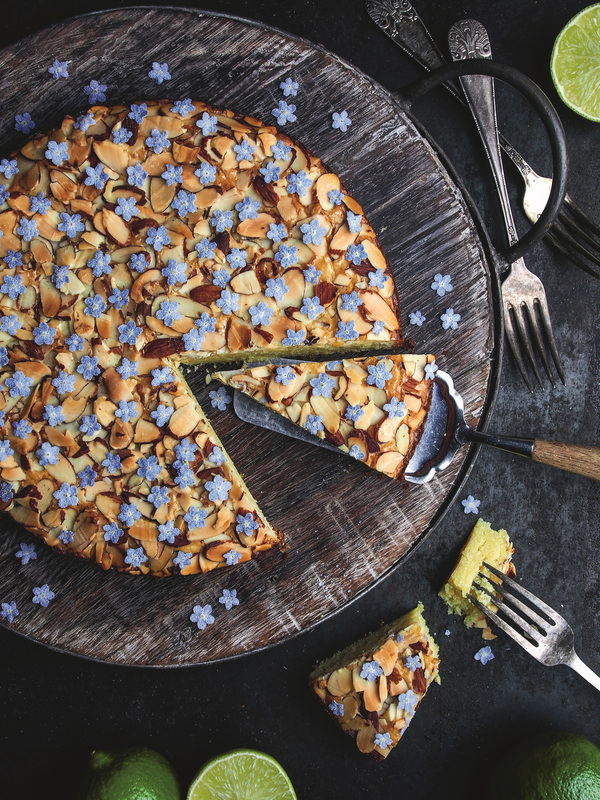 This is a refreshing summer version of the popular chocolate brownie cake, featuring white chocolate and lime and decorated with sliced almonds and candied forget-me-nots. 1. Go for a walk and pick a bouquet of forget-me-nots. 2. With a fork, lightly whisk an egg white with a pinch of salt. 3. Pinch off the flower, leaving a small part of the stem attached. It’s easier to hold the tiny flower this way. 4. Use a small brush to gently paint both the back and the front of the flower with egg white. I usually lay a piece of parchment paper under the flower. When too much egg white has ended up on the paper, I simply exchange it for a new piece. 5. Sprinkle the whole flower with superfine granulated sugar and gently shake off the excess. 6. Cut off the last little piece of the stem. 7. Let the flowers dry, right side up, on parchment paper. They will dry fairly quickly, but let them rest overnight if possible. The candied flowers can be kept for several months in an airtight container. Place the chocolate in a mixing bowl. In a separate bowl, whisk together the sugar, lime juice, lime zest, and eggs. In a saucepan, melt the butter then pour over the chocolate and stir. When the chocolate has melted, add it to the egg mixture. In a separate bowl, combine the flour and salt. Sift the dry ingredients into the batter and fold in with a spatula. Pour the batter into the prepared pan and sprinkle the sliced almonds on top. Bake for 25 to 30 minutes on the middle rack of the oven. Let the cake cool, then decorate with candied forget-me-nots. The cake should be kept in the refrigerator until you’re ready to serve it. 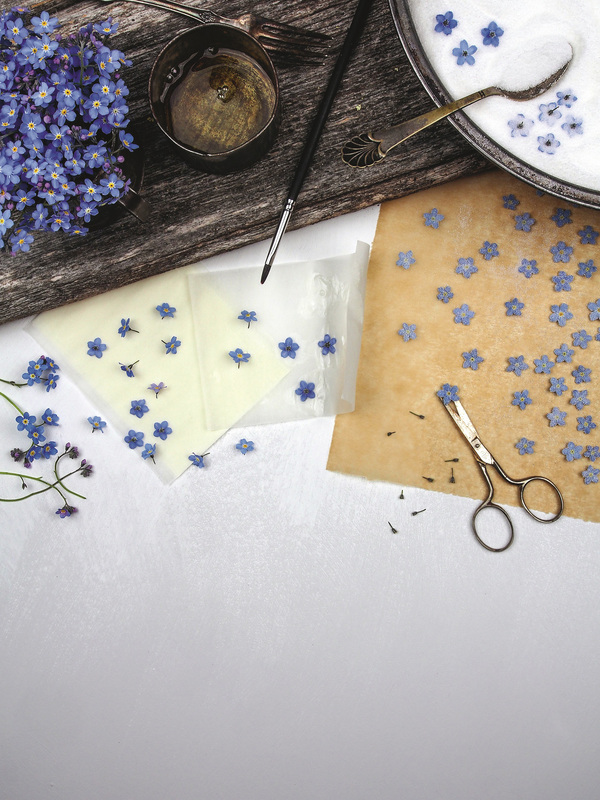 Tip: If you’re not in the mood to pick the flowers—or it’s the wrong time of year—you can make icing forget-me-nots.